In addition to moving small ions and molecules through the membrane, cells also need to remove and take in larger molecules and particles (see (Figure) for examples). Some cells are even capable of engulfing entire unicellular microorganisms. You might have correctly hypothesized that when a cell uptakes and releases large particles, it requires energy. A large particle, however, cannot pass through the membrane, even with energy that the cell supplies. Endocytosis is a type of active transport that moves particles, such as large molecules, parts of cells, and even whole cells, into a cell. 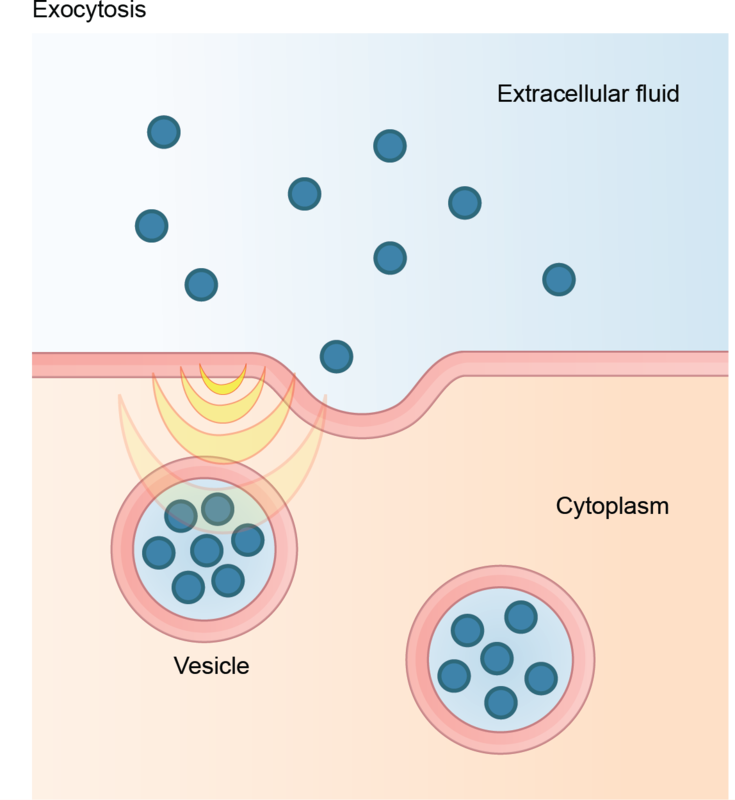 There are different endocytosis variations, but all share a common characteristic: the cell’s plasma membrane invaginates, forming a pocket around the target particle. The pocket pinches off, resulting in the particle containing itself in a newly created intracellular vesicle formed from the plasma membrane. Phagocytosis (the condition of “cell eating”) is the process by which a cell takes in large particles, such as other cells or relatively large particles. For example, when microorganisms invade the human body, a type of white blood cell, a neutrophil, will remove the invaders through this process, surrounding and engulfing the microorganism, which the neutrophil then destroys ((Figure)). In preparation for phagocytosis, a portion of the plasma membrane’s inward-facing surface becomes coated with the protein clathrin, which stabilizes this membrane’s section. The membrane’s coated portion then extends from the cell’s body and surrounds the particle, eventually enclosing it. Once the vesicle containing the particle is enclosed within the cell, the clathrin disengages from the membrane and the vesicle merges with a lysosome for breaking down the material in the newly formed compartment (endosome). When accessible nutrients from the vesicular contents’ degradation have been extracted, the newly formed endosome merges with the plasma membrane and releases its contents into the extracellular fluid. The endosomal membrane again becomes part of the plasma membrane. A variation of endocytosis is pinocytosis. This literally means “cell drinking”. Discovered by Warren Lewis in 1929, this American embryologist and cell biologist described a process whereby he assumed that the cell was purposefully taking in extracellular fluid. In reality, this is a process that takes in molecules, including water, which the cell needs from the extracellular fluid. Pinocytosis results in a much smaller vesicle than does phagocytosis, and the vesicle does not need to merge with a lysosome ((Figure)). A variation of pinocytosis is potocytosis. This process uses a coating protein, caveolin, on the plasma membrane’s cytoplasmic side, which performs a similar function to clathrin. The cavities in the plasma membrane that form the vacuoles have membrane receptors and lipid rafts in addition to caveolin. The vacuoles or vesicles formed in caveolae (singular caveola) are smaller than those in pinocytosis. Potocytosis brings small molecules into the cell and transports them through the cell for their release on the other side, a process we call transcytosis. A targeted variation of endocytosis employs receptor proteins in the plasma membrane that have a specific binding affinity for certain substances ((Figure)). 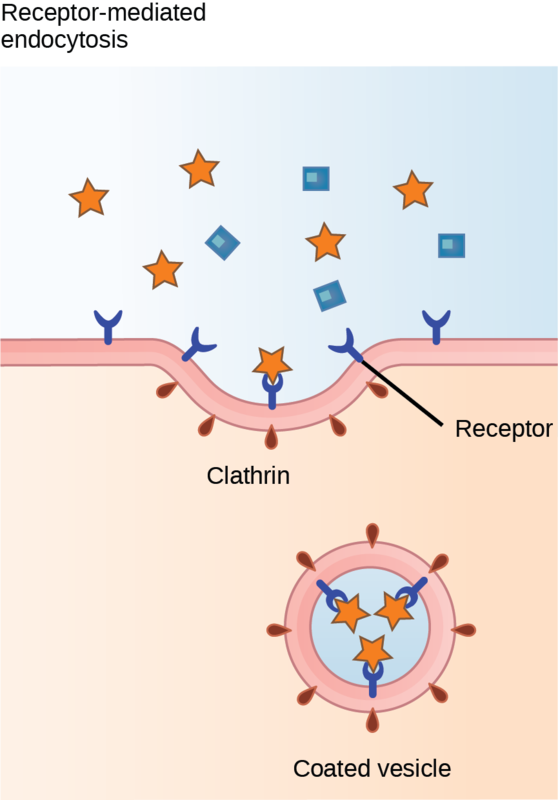 In receptor-mediated endocytosis, as in phagocytosis, clathrin attaches to the plasma membrane’s cytoplasmic side. 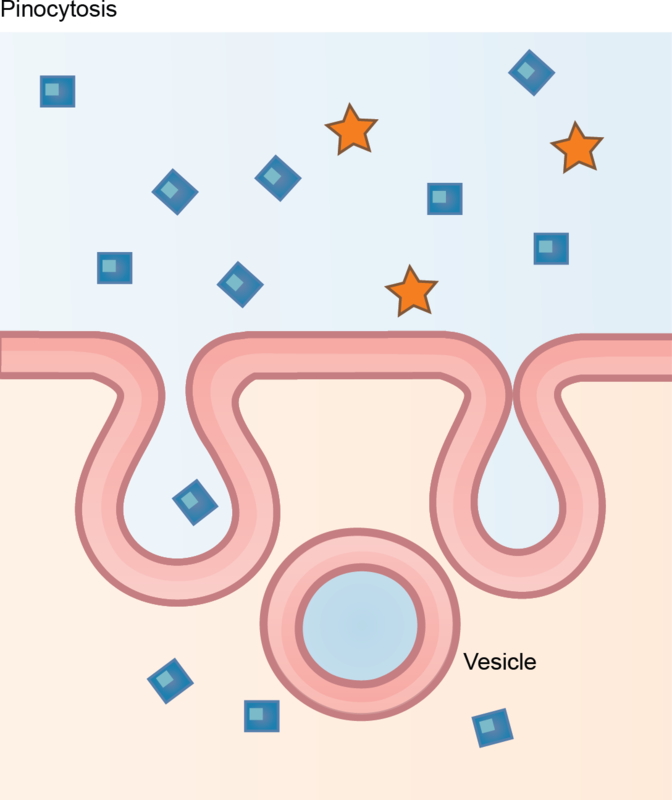 If a compound’s uptake is dependent on receptor-mediated endocytosis and the process is ineffective, the material will not be removed from the tissue fluids or blood. Instead, it will stay in those fluids and increase in concentration. The failure of receptor-mediated endocytosis causes some human diseases. For example, receptor mediated endocytosis removes low density lipoprotein or LDL (or “bad” cholesterol) from the blood. In the human genetic disease familial hypercholesterolemia, the LDL receptors are defective or missing entirely. People with this condition have life-threatening levels of cholesterol in their blood, because their cells cannot clear LDL particles. Although receptor-mediated endocytosis is designed to bring specific substances that are normally in the extracellular fluid into the cell, other substances may gain entry into the cell at the same site. Flu viruses, diphtheria, and cholera toxin all have sites that cross-react with normal receptor-binding sites and gain entry into cells. See receptor-mediated endocytosis in action, and click on different parts for a focused animation. The reverse process of moving material into a cell is the process of exocytosis. Exocytosis is the opposite of the processes we discussed above in that its purpose is to expel material from the cell into the extracellular fluid. Waste material is enveloped in a membrane and fuses with the plasma membrane’s interior. This fusion opens the membranous envelope on the cell’s exterior, and the waste material expels into the extracellular space ((Figure)). Other examples of cells releasing molecules via exocytosis include extracellular matrix protein secretion and neurotransmitter secretion into the synaptic cleft by synaptic vesicles. Active transport methods require directly using ATP to fuel the transport. In a process scientists call phagocytosis, other cells can engulf large particles, such as macromolecules, cell parts, or whole cells. 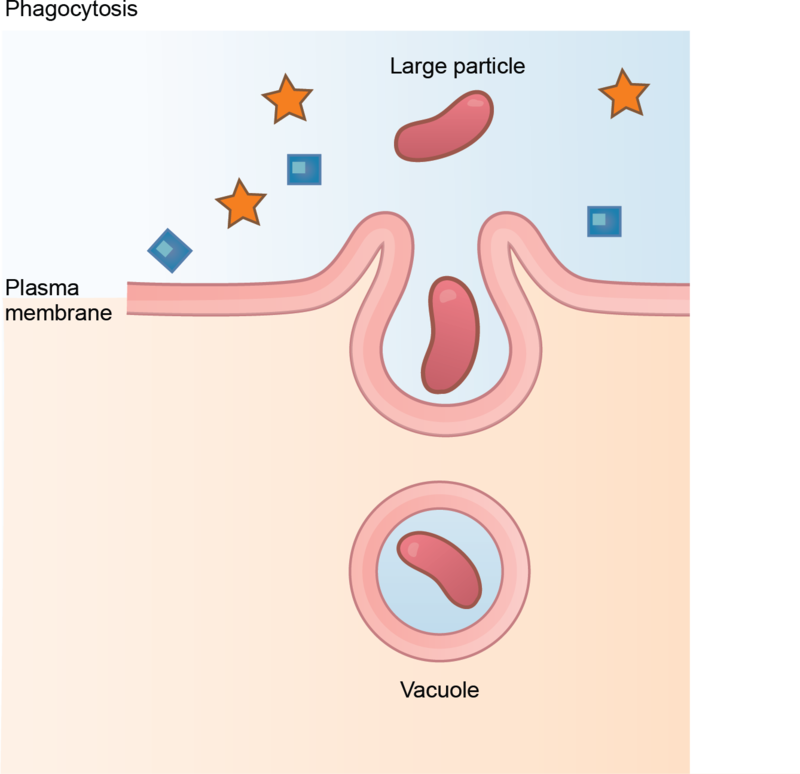 In phagocytosis, a portion of the membrane invaginates and flows around the particle, eventually pinching off and leaving the particle entirely enclosed by a plasma membrane’s envelope. The cell breaks down vesicle contents, with the particles either used as food or dispatched. Pinocytosis is a similar process on a smaller scale. The plasma membrane invaginates and pinches off, producing a small envelope of fluid from outside the cell. Pinocytosis imports substances that the cell needs from the extracellular fluid. The cell expels waste in a similar but reverse manner. It pushes a membranous vacuole to the plasma membrane, allowing the vacuole to fuse with the membrane and incorporate itself into the membrane structure, releasing its contents to the exterior. What happens to the membrane of a vesicle after exocytosis? It is disassembled by the cell. It fuses with and becomes part of the plasma membrane. It is used again in another exocytosis event. Which transport mechanism can bring whole cells into a cell? In what important way does receptor-mediated endocytosis differ from phagocytosis? It transports only small amounts of fluid. It does not involve the pinching off of membrane. It brings in only a specifically targeted substance. It brings substances into the cell, while phagocytosis removes substances. Many viruses enter host cells through receptor-mediated endocytosis. What is an advantage of this entry strategy? The virus directly enters the cytoplasm of the cell. The virus is protected from recognition by white blood cells. The virus only enters its target host cell type. The virus can directly inject its genome into the cell’s nucleus. Which of the following organelles relies on exocytosis to complete its function? Imagine a cell can perform exocytosis, but only minimal endocytosis. What would happen to the cell? The cell would secrete all its intracellular proteins. The plasma membrane would increase in size over time. The cell would stop expressing integral receptor proteins in its plasma membrane. Why is it important that there are different types of proteins in plasma membranes for the transport of materials into and out of a cell? The proteins allow a cell to select what compound will be transported, meeting the needs of the cell and not bringing in anything else. Why do ions have a difficult time getting through plasma membranes despite their small size? Ions are charged, and consequently, they are hydrophilic and cannot associate with the lipid portion of the membrane. Ions must be transported by carrier proteins or ion channels. Bulk Transport by OpenStax Biology 2nd Edition is licensed under a Creative Commons Attribution 4.0 International License, except where otherwise noted.